At the nationwide philosophy conference where most new hires in the field are made, a cocktail party called "the smoker" is part of the hiring process. And some philosophers, especially women, would prefer that evaluation of job candidates take place in a less boozy environment. According to Inside Higher Ed, "the smoker" is "officially just a reception" at the American Philosophical Association's Eastern division meeting. But philosophers say formal job interviews sometimes take place there, and in other cases, candidates may be asked to attend the reception after their interviews are over. Failing to do so, or failing to impress once there, could cost them a job. Some say the smoker is no longer a major part of the hiring process, but Georgetown professor Rebecca Kukla counters, "I have heard lots of stories about people who were apparently ruled out for jobs because they did not show up at the smoker." All the literature on interviewing suggests that it is best done in a structured setting where each candidate gets an equal chance to speak and the effects of bias are kept to a minimum, so what do we think is going to happen when we conduct a second round of "informal" interviews, now late at night, over drinks, and in a dimly lit room? Those of us with small children or heavy sleep needs just need to deal with it, I guess. While I know that there are plenty of men who face these challenges as well, it is hard to imagine a better piece of evidence of the maleness of our profession. But hey, look at the bright side: the only other time I've attended the smoker, I was hit on. This time around, my pregnant figure is likely to keep me from being subjected to that. University of Chicago Brian Leiter calls the practice "probably a leftover from the time before equal employment laws kicked in." 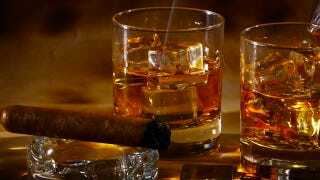 It does harken back to the era of old boys clubs and job offers made over whiskey and cigars — an era that may not actually have ended. This form of hiring isn't just bad for women — it disadvantages anyone who, for any reason, isn't at his or her best in a cocktail party environment. And as Jennifer Saul of the University of Sheffield says, mingling and glad-handing are "not actually the skill[s] they should be looking for in academic jobs." Whether or not actual hiring decisions are made there, philosophers seem to feel that the smoker is more than just a networking event — and that in itself is a problem. At least some job candidates evidently think that they need to attend the party and charm their prospective employers if they want to get a job. If that's not true, then university hiring committees need to make that abundantly clear. And if it is true, they may want to rethink their priorities.